I have to admit I am a skeptic. A friend told me she watched me close the shutters and completely shut down when visiting a palm reader almost in a challenge to see if she could possibly be telling the truth or was just a scam artist. I have a hard time believing it when friends tell me about their alternative medicine adventures. I do know there is a mind body connection that we don't fully understand and that it is likely going to be an important thing. In general though, I prefer to put my health eggs in the verified by science basket and tend to scoff at more "woo-woo" varieties. It is hard to suspend my disbelief. (And in certain cases, I have no interest in staying open to debate. Vaccines are science. Cancer is not cured through alternative means. Etc.) But I also try to challenge myself on occasion, to look at a belief system not my own and see if it speaks truth to me, as it clearly does to the possessor of those beliefs, hence reading Sarah Bamford Seidelmann's memoir of her journey from medical doctor with a Western mindset to a shamanistic healer open to a spiritual world not accounted for in her medical training. 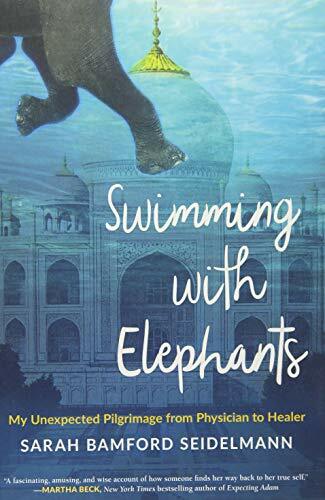 Short answer, I still side with observable, provable science but I don't doubt that Seidelmann fully believes in her chosen path which she has chronicled in Swimming with Elelphants. Seidelmann was a traditionally trained medical student when she started questioning whether patients are given the best course of treatment. Or perhaps it's more accurate to say she questioned whether patients were given enough or if their drug protocol should be supplemented by other, less tangible things. This idea would continue to haunt her and to resurface throughout the years. The intensity of schooling, work, parenting, and home renovation threatened Seidelmann's marriage and her well being. In fact, she was overwhelmed and unhappy. A long sabbatical and travel beyond the Western world refocused her on the direction she wanted to move in. She embraced the mystical, dreamt of animal guides, and turned towards shamanism along the way to reinventing herself as a life coach and traditional healer. Seielmann had the support and the money to enable herself to take the time to travel, to explore the dreams she found so inspiring, to change her path and it has worked out beautifully for her. Not everyone has that luxury even if they have the inclination. She details not only the journey she took but many of the otherworldly signs and unconscious visions that led her where she ultimately went. The narrative of these dreams might be fascinating to someone else moving in a similar trajectory to her but they were too frequent, too lengthy, and made my skepticism hit high alert. I just couldn't connect with the book, Seidelmann's choices (whether in terms of her career or in terms of her parenting and marriage), or her mindset and so it became increasingly difficult to continue reading. I did finish the entire book, rolling my eyes much of the time so this was clearly not meant for me. If you are a searcher, maybe this will speak to you in a different way and you will benefit from it. I just didn't.